Thrills and spills on the final bend. The second round of the ARRC series took place this weekend at the Chang International Circuit and provided close racing in all classes with exciting finishes. The famous turn 12, the final turn into the finish area providing some hair raising moments. In Saturday’s Suzuki challenge race we had around 10 riders together into the bend on the last lap and a coming together saw 7 riders go down in a spectacular crash (all involved got up unhurt and most re-mounted to finish). 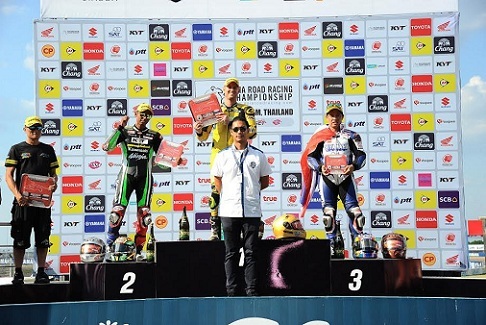 In the Friday race Punchana of Thailand got onto the podium but this last corner incident on Saturday ended the hopes of the 3 Thai riders in the race making the podium. 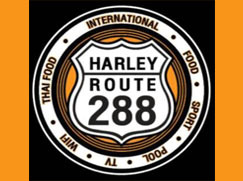 The Asia production 250 racing saw Anupab of Thailand getting a second place on Friday and a third on Saturday to please his home supporters. The Underbone 150cc class provides really good close racing & these fast little bikes really perform well at this circuit but no Thai entrants in this class. The 600cc Supersports series provide the best races at ARRC events & it was no exception here .In Friday’s race regular visitor Anthony West of Australia got a good third place some 3 seconds behind the winner Azlan of Malaysia with Chalermpol of Thailand in second place. Saturdays race (The last race of the day) was full of incident on and off the track with first Chaermpol penalized with a drive through penalty for a jump start which then put him way down the field. Anthony West on the podium but not for long. The race over 16 laps was contested to the finish by Anthony West/Azlan & Kraisart of Thailand and that’s how they finished. The result did not stay like that as when the first 3 bikes went through race control procedure ,normal checks were carried out and found to be OK. However another request by another team and ARRC asked for West’s engine to be removed. There were more developments as it was found that West’s engine could not be removed and he was disqualified from Friday & Saturday’s races. I think we will have more on this from a further enquiry and we will keep you posted.